The joint initiative between La Biennale di Venezia and the Victoria and Albert Museum began in 2016. Each year, the two institutions curate together a Special Project in the Applied Arts Pavilion in Venice, visited by over a quarter of a million people. La Biennale di Venezia was founded in 1895 and presents one of the most famous and prestigious cultural events in the world. The Victoria and Albert Museum was founded in 1857 and is the world’s leading museum of art, design and performance – with collections unrivalled in their scope and diversity. The partnership therefore brings together two of the world’s leading creative institutions, and remains the only special project between La Biennale and an international museum. 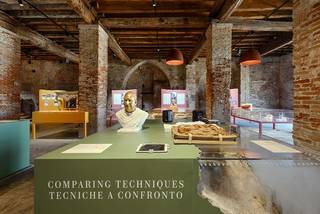 2018 marks the third year of collaboration between La Biennale di Venezia and the V&A. Based in the Applied Arts Pavilion, the 2016 project was A World of Fragile Parts, this year the exhibition is Robin Hood Gardens: A Ruin in Reverse. The collaboration was instigated by President Paolo Baratta from La Biennale di Venezia and by the late Dr Martin Roth, the V&A’s director from 2011 – 16. It remains one of his greatest legacies and is one of the Museum’s most important international initiatives. To honour Dr Roth’s memory, the V&A has established a Venice Architecture Biennale Fund, which aims to secure the long-term future of this creative partnership, and would like to extend special thanks to its donors and Volkswagen Group.